I made these months ago. I declared they were amazing and that I wanted them at least once a week, then promptly forgot about them. Thankfully, I have a boyfriend who likes to look through my cook books. He found this recipe, he made it, declared that it was amazing and that he wanted it at least once a week, then made it for me when I came round next. And you know what? 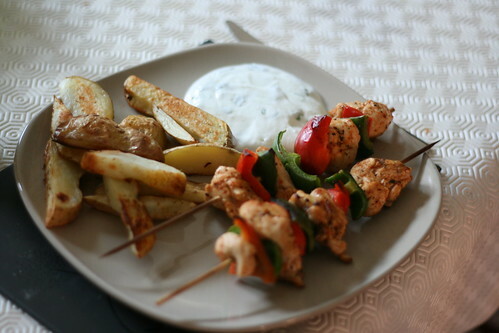 These kebabs are amazing. I want them at least once a week. And you will too. 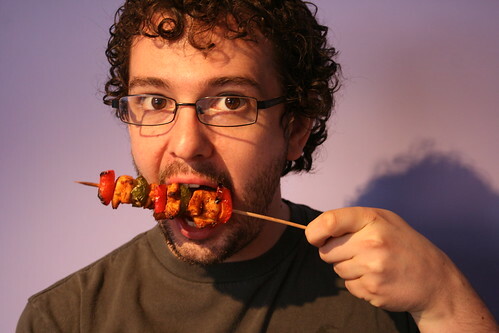 You’ll need eight kebab skewers, too. 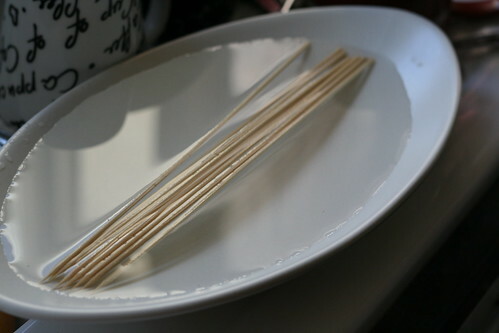 Here’s a handy hint for you; if you’re using wooden ones, soak them in cold water for 30 minutes before using them. This should go some way to stopping them from splitting and giving you splinters in your dinner. 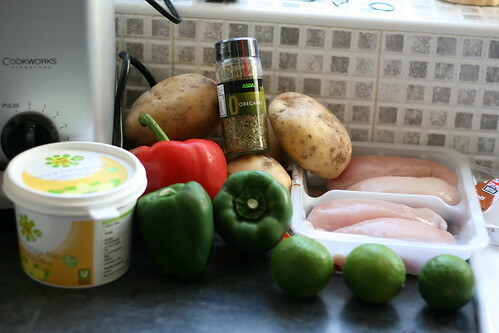 Preheat the oven to 200C whilst you prepare the wedges. 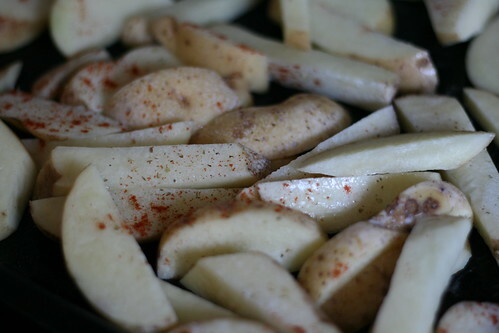 Cut the potatoes into long, thick wedges and put them on a baking sheet sprayed with Fry Light. Spray them themselves with Fry Light (for extra crispy wedges) and sprinkle over four teaspoons of the paprika and two teaspoons of the oregano. Twist over some black pepper and cook in the over for 20-25 minutes. 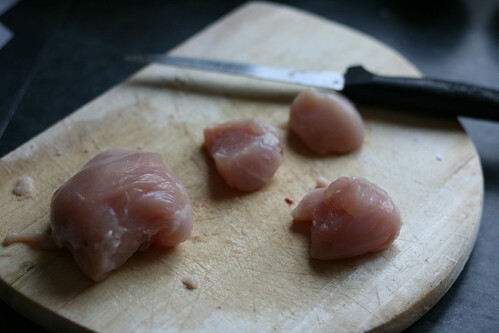 Meanwhile, cut the chicken into bite size pieces. Then put them in a bowl along with the juice of the limes and two tablespoons of Cajun spice. 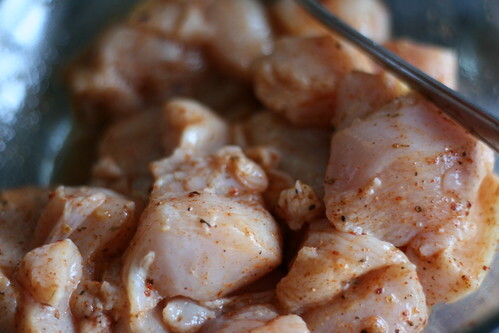 Mix well so that each chunk of breast is well coated, then leave them to marinade. Pop your grill on to pre-heat whilst you prepare the kebabs. 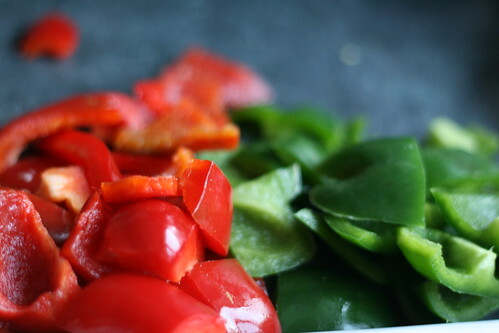 Deseed the peppers, and cut them into bite size pieces. You can make them as big or as small as you like. 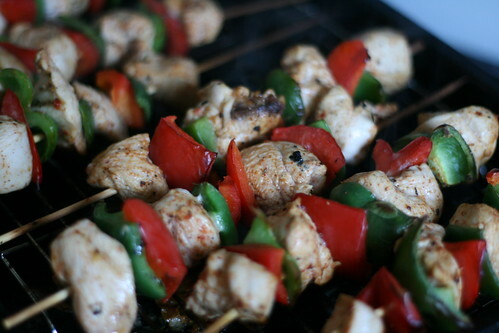 Then just divide the chicken and pepper pieces between the skewers. Then place the kebabs under the hot grill. They need to cook for about 10-12 minutes, and be turned two or three times. Mmmmmmm! Mix the yogurt with the chopped parsley, and serve all three things together. Garry made his slightly differently. He mixed grated cucumber in with the yogurt and left it overnight to make the dip extra cooling. It works really, REALLY well. 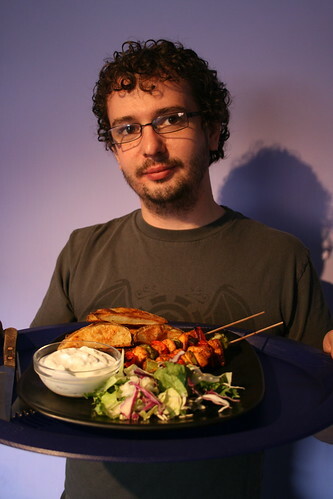 He serves his with salad too, which is also scrummy.